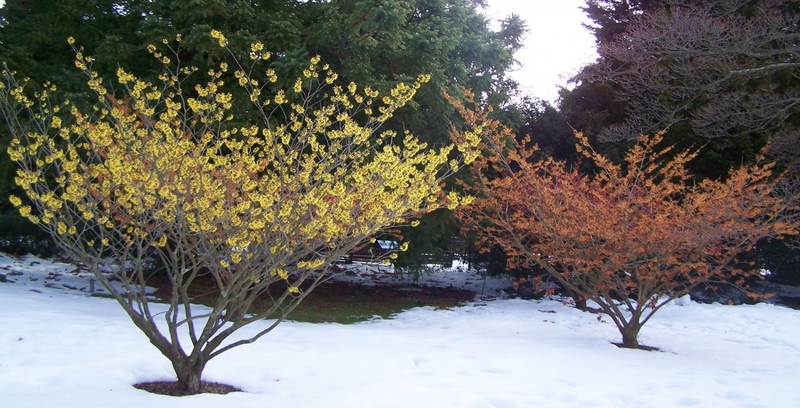 Hamamelis virginiana, also known as common witch hazel, is an underutilized, native, deciduous tree. Witch hazel has some of the best architectural features of a small tree. In the winter, on days like today, when the garden can feel a bit bleak, this small tree offers great shape, and quite possibly some flowers. This native wonder blooms in December to early spring. Yesterday, when the sun was out and warming the gardens a tad, a few witch hazel buds were starting to open a smidgen and a few were in full bloom: an early siren call of what’s to come. Not an overbearing flower by any stretch of the imagination, the witch hazel flower makes you pause and lean in to appreciate it. Some flowers are rather petite, while others are more elaborate and flashy. But even the flashiest witch hazel flower is a demure relation to the over the top blooms of the magnolia and buckeye. You may first notice this tree from afar on a calm, winter day when a haze of color appears on a white or as is often the case, a gray day in the Queen City. A yellow glow, or perhaps burnt orange, brightens the garden, pulling you in to notice hundreds of tiny flowers along the tree’s long, slender branches. Its thick, crinkly leaves provide great fall color. The tree is tolerant of clay, is deer resistant and is well suited for full sun (best blooms) to part shade. It’s seldom bothered by pests or disease. All this good new begs the question, why don't we see more of it in the home landscape? Look about your yard, where you see the invasive honeysuckle may just be the ideal site for a witch hazel. Photos: It was a very cold, gray, still morning in the gardens today when I came across these two witch hazels just starting to bloom. Little promisses of color to come to the gardens.